Skulls freak us out. Can you blame us? They're the concrete reminder that we're mortal and that eventually, all living things must surrender to the cold, icy black hand of death. Yes, nothing is more frightening than a human skull... except perhaps a giant dinosaur skull! Not only does a dinosaur skull show us the mortality of all living creatures, but it's the size and shape of a terrible beast that could devour us in a single bite! 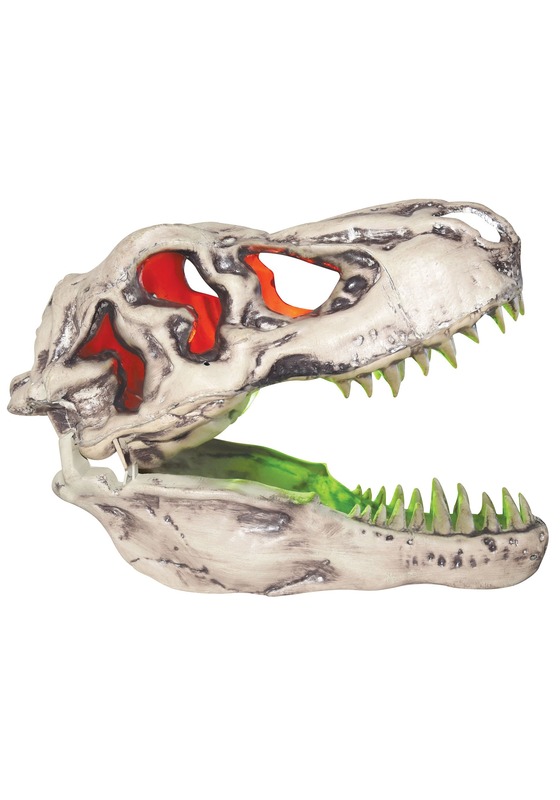 Now you can bring the frightening aura of the skull to your party with this Light-Up T-Rex Skull Prop. This skull prop recreates the look of a vicious T-Rex's skull. It's made out of plastic and features a movable jaw, so you can pose it in a variety of positions. It makes dinosaur sound effects and it even lights up with green and red lights in the jaw and eye sockets. Get a creepy look for your home by adding it to your party decor! Looking for a unique idea for your Halloween party? Try a prehistoric party! You decorate your home like a prehistoric jungle, add this skull, and encourage everyone to dress up like their favorite dinosaur!